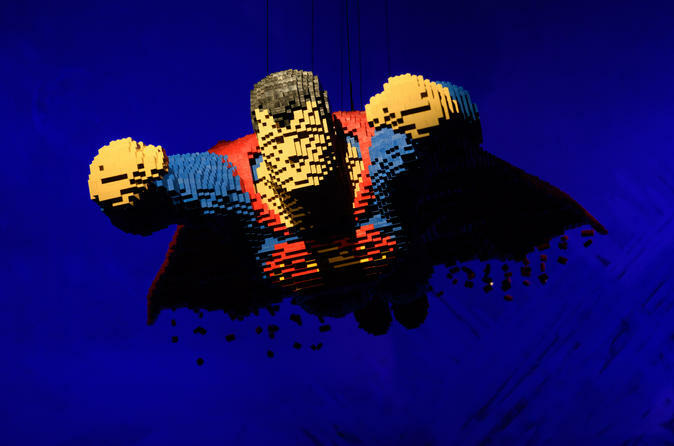 If you’re a comic aficionado, superhero enthusiast, or Lego lover, don’t miss ‘The Art of the Brick: DC Super Heroes’ during its showing in London. With this admission ticket, you’ll have access to artist Nathan Sawaya’s exhibition inspired by some of the world’s most beloved super heroes and enduring villains. The exhibition features more than two million Lego bricks and takes place on the city’s South Bank. Head to Doon Street Car Park on the South Bank of London for your admission to ‘The Art of the Brick: DC Super Heroes’ by Nathan Sawaya, an American-based artist known for his extraordinary work with Lego bricks. As you walk through the purpose-built space, be wowed by more than 120 large-scale exhibits constructed from more than two million bricks, such as a flying Superman and a Batmobile. Most visitors spend 60 to 90 minutes at the exhibition. There is a place at reception to leave strollers, but you do so at your own risk. A small coffee shop is available (own expense), and there is disabled access. There is a public parking lot at the National Theatre opposite the entrance of the exhibition (own expense).